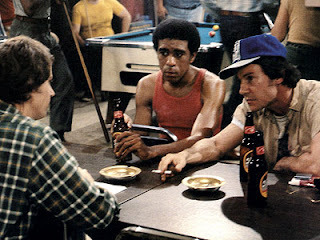 One of the greatest performances in cinema, barely recognized by the Hollywood establishment, is undoubtedly Richard Pryor’s astonishing turn as Zeke the conflicted auto worker in Paul Schrader’s amazing directorial debut 'Blue Collar'. The racial barrier in Hollywood was never more egregious than the lack of recognition for Pryor’s work here. Pryor is so utterly compelling from the very first frame on screen only Brando’s dramatic Hollywood coronation in 'A Streetcar Named Desire' might compare. The performances of Harvey Keitel and Yaphet Kotto match Pryor’s, a unique dynamic which helped each of the actors inject infallible honesty and sympathy, even at their worst moments, to their characters. Pryor, Keitel and Kotto play three friends, Zeke, Jerry and Smokey, toiling away on the line of a Detroit-area car manufacturing plant, each of them barely making a living. When they’re pushing up against the corrupt Union or suffering from the financial pressures of raising a family, or in Smokey’s case trying to make a living as an ex-con trying to go straight, the tension of their lives is thick. Pryor articulates these frustrations, frustrations of all blue collar workers living in America at the time, emphatically in his dramatic speech during their Union hall meeting. It’s Pryor’s first speech, running about 2 minutes in length, a scene written to play off his notoriety as a stand up comic, but also to establish his credibility as a dramatic actor. With this scene Schrader successfully breaks our preconceptions of Pryor as a comedian and this picture as a comedy. The rest of the film plays out the dramatic journeys of Zeke, Jerry and Smokey with earth shattering fury. After a wild (and controversial) party scene involving some coke and some local prostitutes the three hatch a plan to rob the local union office. Unfortunately, when they do the job they don’t find money but something more lethal, a smoking gun ledger of illegal loans borrowed from union funds. From here the bond of the three characters is pushed to the extreme. Schrader masterfully shows how the union uses the isolation of the three heroes to dissolve their bond of friendship - a tragic irony considering it's an organization originally set up to unite brothers of labour. Whether it’s overt violence or financial incentives to buy off their morals, they must either stick to the principles so dramatically articulated by Pryor’s introductory speech or sell out and become the enemy. Schrader, notable as a critic before becoming a celebrated screenwriter, wears some of his influences on his sleeve. The social realist tone of Rossellini and Bresson is strong, even the Peckinpah-esque opening sequence, a series of freeze-frame credits, punctuated by Jack Nitzsche/Ry Cooder’s bluesy music cue adds a strong cinematic Scorsese-like flare. The behind-the-scenes production of this film has made for good anecdotal stories over the years, particularly the conflict between the three actors. Schrader has cited an on-set punch-up between a drug-addled Pryor and Keitel (likely drug-addled as well) causing the director to have a mental breakdown. None of the conflict inhibited the execution of the story or the chemistry of the characters on screen. What did get imbued was the resounding passion for this story and the sharp commentary the film makes on the influential union movement in America at the time, including the socio-economic hardship of its salt-of-the-earth workers. Blue Collar is one hell of a film anchored by a Richard Pryor performance that is criminally underrated. Really don't get why more people don't talk about and study this film. It's one of the best movies of the 70s, which is saying something. Never been sure how I feel about the final scene and shot, but I take that as I good thing. I concur Unknown. As for the final shot, indeed its odd, but effective for me. Ending the film on the most heated argument in the film is kinda powerful - a completion of the arc of the characters, strong bond of friendship now fully devolved into racial slurs and physical violence.